Quantum Paleo is not… long or complicated. It’s concise by design. Most diet books are not read cover to cover—readers typically search for what they need to know. QP cuts to the chase and tells you what you need to know to achieve results. 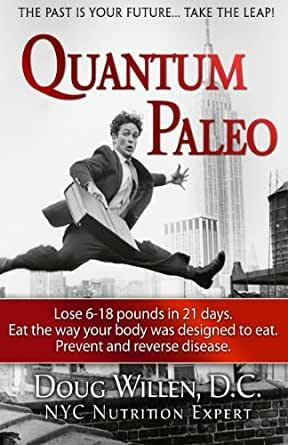 Quantum Paleo is… a proven path to vitality and health used by Dr. Doug in his NYC wellness practice for the past 14 years. Dr. Doug continues to work with professionals, families, celebrities—people from all walks of life, including the casts of dozens of Broadway shows and the elite dancer/athletes of New York’s premier ballet companies. He is NYC’s “Heath Fixer”. This book is awesome! I've have spent 10+ years bodybuilding and have always struggled with getting my body fat percentage low enough to see good definition. When I started paleo according to Dr. Willen's recommendations, I was 12% BF, within a month I had cut down to 8% and after another month I was about to 5-6%. Previously, I would have had to go through a horrible "cutting" phase to lean up. Anyone who has cut before know how terrible of an experience this can be. Following Dr. Willen's advice, I actually enjoyed the process of getting that lean. To be clear, I was cutting my calories and eating paleo which made it happen faster. This diet will help you be naturally healthier and leaner. I highly recommend this book for everyone!! I have been exposed to the Paleo diet by numerous friends and family members. (that and other eating plans that are similar) and while my brain thought it all made sense my heart simply was not convinced. Reading Quantum Paleo helped convince me that I need to at least give it 21 days to see if I have any of the same positive responses that are documented in the book and that my friends and family have experienced. It is too early to say if I will continue with the Paleo style of eating. It is not too early to say that this book is the reason that I am even trying. Do yourself a favor and take the time to read this book. It might just help inspire you as well. 5.0 out of 5 starsMost inspirational weight loss book! I've read multiple "diet" books. This book is hands down the most inspirational book I've ever read! I've book marked my Kindle edition to death. I've gone back on hard days and reread portions. I also agree with a natural Paleo style of eating. I've read multiple books on the Paleo or Primal diet. Most are scientific or recipe driven. This book really nails the diet in a concise way, and yet is inspiring to such a degree that I knew I would not fail! I have recommended it to many friends and family. It will motivate weight loss! I had no prior knowledge of this author. I found him searching for Paleo books in the Kindle store. I'm hooked! I hope he writes more books in the future on other disease conditions/health etc. I will buy any book he authors. 5.0 out of 5 starsAmazing! Well written and easy to understand! Are you thinking about changing the way you eat, sleep and look at food again!? If so, this is the book for you. I was unsure about the Paleo diet prior to reading this book but Doug Willen made me a believer in the first chapter. He really helps you understand the diet and what it could do for you. I did my first 21 days and list just over 6 pounds! I was amazed. I have tried so many different books and diets. This book just made me realize that you need to change your lifestyle and not just what you eat. I think that anyone who is somewhat interested in Paleo needs to read this book first! You will not regret it... I promise! 5.0 out of 5 starsAll you need to learn how to eat. And more you never knew you needed. I consider myself somewhat if an expert in exercise and nutrition, so I can say with some confidence than one need look NO FURTHER to fix your diet and also you're life. Since its kind of my job, I've tried all the diets out there. But despite the staunch devotees of the Paleo lifestyle, I was late to give it a go. Once I read Dr. Willen's quick, easy, and often gripping adventure story, I had to try it. And I can say the effects were immediate and I can throw away every other book on eating that I own. The diet is incredibly simple--eliminate sugar, dairy, and grains--no small feat in our modern society of grab-n'-go convenience. But this book isn't about the how. It's about the WHY. And no one in the health industry has ever illuminated the glaringly obvious reasons better than Dr. Doug. Even better, he does so in a way that makes you want to slap your head and exclaim, "Why didn't I think of that?!" Yet it's never scholarly or scolding. He's funny, friendly, clearly an expert, and sometimes devastatingly correct. He makes you want to choose this lifestyle yourself, and succeed despite past failed attempts, or habits you thought you could never break. Quantum Paleo goes way beyond food, and even requires you to take up a hobby as part of the program. What diet book has ever done that? I can't stress enough how much anyone interested in improving their overall health and wellness should read this book. I promise you it will change not just your body, it will change your life.